Over the weekend of Saturday 25th & Sunday 26th August the Pope visited Ireland. For this event a number of special services operated for Events in Croke Park, Knock (near Claremorris) and the Phoenix Park in Dublin. In contrast to the visit of Pope John Paul to Ireland in 1979, the majority of scheduled services continued to operate, whereas in 1979 all scheduled bus and rail services were cancelled with all resources used in providing special train & buses to the events in Dublin and elsewhere. Notwithstanding the changing times in Ireland over the last 39 years the railway company still provided several Intercity Specials to Dublin for the Papal Mass in the Phoenix Park on the Sunday in addition to the regular scheduled morning services. 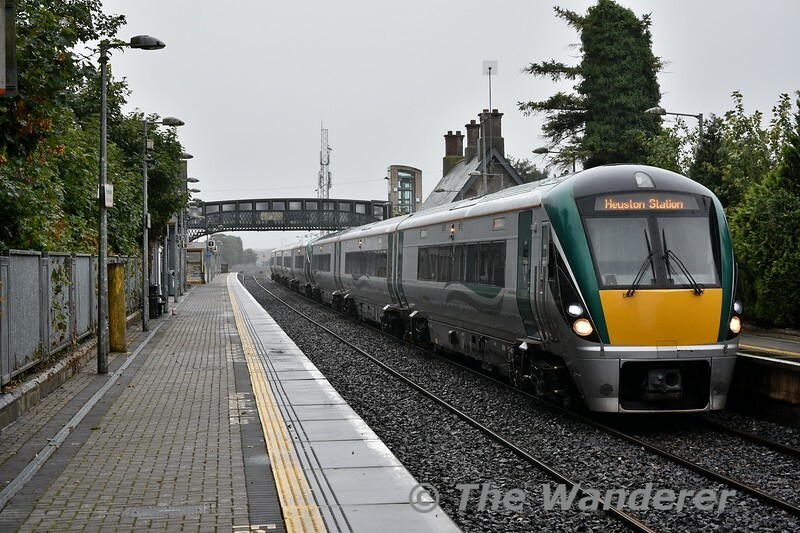 In Dublin area itself, the Kildare/Portlaoise commuter service had additional capacity with 3 specials each from Portlaoise and Kildare to supplement the regular scheduled service, which was strengthened from the usual 3ICR to 2X3ICR. On the Connolly side special timetables operated all day on the DART, Northern, Maynooth & M3 Parkway Commuter routes, the highlight being a 10 minute frequency between Connolly and Clonsilla on the Maynooth/M3 Parkway route as Ashtown Station is only a few minutes’ walk from the Phoenix Park. Listed below are the services which operated for the events across the country. Specials on Sunday for the DART, Northern, Maynooth & M3 Parkway Commuter routes are not listed as a special timetable was in force on these routes. For the weekend, I was in the Portlaoise area and popped over to the station on Sunday morning to see the 3 additional special services depart from the station, plus photographing the Limerick, Cork and Tralee specials passing through.